This delicious pink and green ladybug tutu set is made of 100% soft nylon diamond weave Shimmer tulle in Hot pink, and Lime green colors. It is sewn onto elastic for extra durability, so your princess can play around in it for a long time to come. The elastic waistband allows room for growth and the way it is sewn will make it expand up to 5 inches for when she gets bigger. There are 100 yards of material in this tutu that make it very full and fluffy. All the layers are diagonally cut pixie-style to make it look even perkier and fluffier. The waistband features a lime polka dots pink ribbon and ladybug bows.. 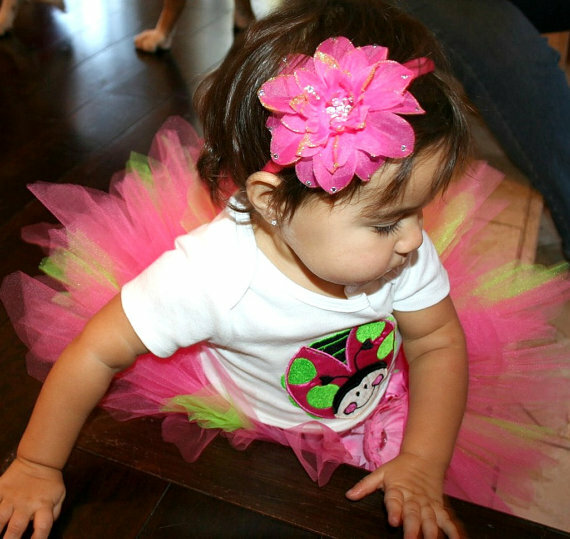 The tutu comes with the matching crochet headband, in lime green color and hot pink flower on an alligator clip. 3. crochet headband with flower clip. Please note that wings, flowers, ribbons, and any other embellishments are subject to availability. If a specific item is not in stock, we will substitute with a similar item to coordinate perfectly with the original set. This item is custom made in the US. Please allow up to 15 business days (Monday thru Friday) for your order to be created, plus shipping time.